*I don't think she is crazy @ all. With its white sand and clear, blue water, Trinidad's Matura Beach looks like a postcard. 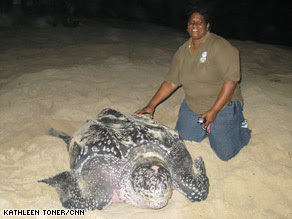 It's a far cry from its recent past, when leatherback sea turtle carcasses littered the ground and kept tourists away. "Twenty years ago, this was a graveyard," Suzan Lakhan Baptiste said of the six-mile stretch of beach near her home. "The stench was horrendous. You could smell it for miles," she said. Saddened and frustrated, Baptiste launched a crusade to help end the slaughter of the gentle giants. Today, she and her group are succeeding: What was once a turtle graveyard is now a maternity ward -- one of the largest leatherback nesting colonies in the world. It hasn't been an easy fight for Baptiste or the turtles. For 100 million years, the creatures have traveled the world's oceans, outliving the dinosaurs. Over the last 30 years, they have become critically endangered worldwide because of fishing, pollution and hunting. For centuries, they've been hunted throughout the Caribbean for their meat and fins, and also for their eggs, which some people prize as aphrodisiacs.